Hydrex offers a wide range of water storage solutions. 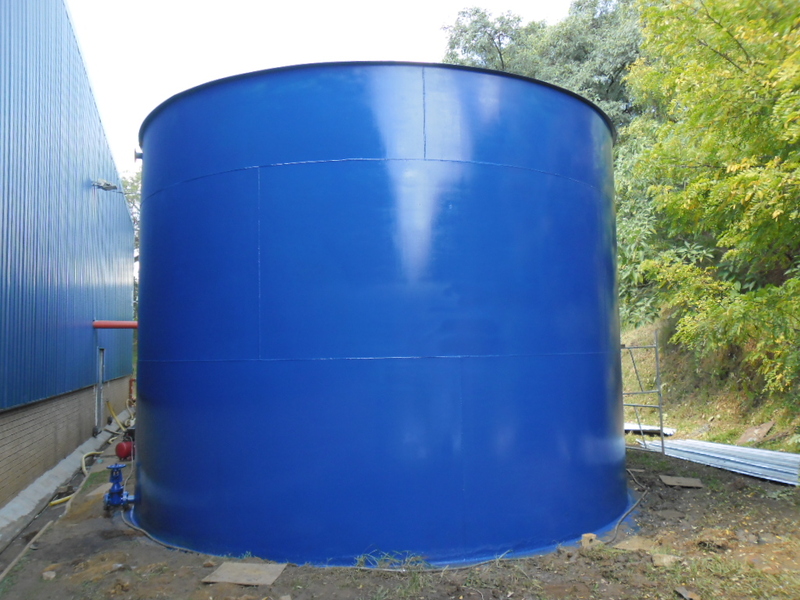 Our water storage solutions include roto moulded products, collapsible water tanks through to high end steel panel tanks. This page will give the reader a summary of the different types of water storage systems with a link to the relative pages giving more detailed information. 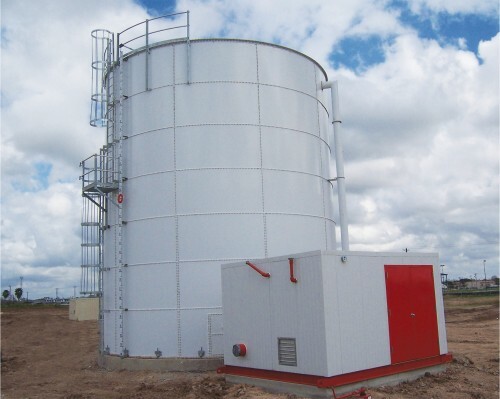 Roto moulded tanks have become common place in all urban areas in Africa. Roto moulded tanks typically cater for storage volumes of 100 Liters through to 15 000 Liters. Click on the link below for a complete list of roto moulded products. Water bladders are rapidly deployable products that are generally used for emergency water storage. Hydrex water bladders are also used in remote areas where there is not sufficient time to build a traditional water storage tank or system. Click on the link below to find out more about the Hydrex range of water bladders and emergency water storage solutions. 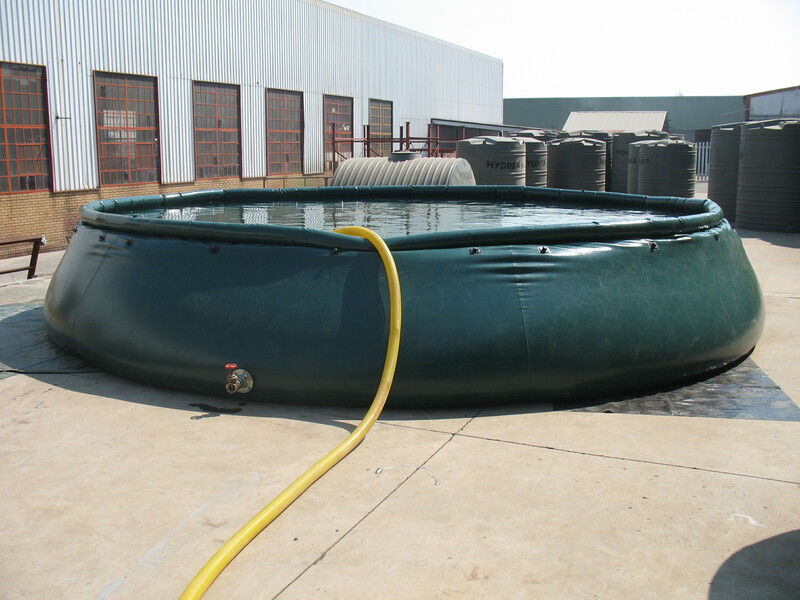 S tanks or onion tanks as they are often called, offer convenient short term, rapid deployment water storage solutions. They are often used by the military for camp based water storage solutions together with water bladders. Pool maintenance companies also find the products useful while doing maintenance on existing swimming pools without wasting all the available water. S tanks or Onion tanks have a higher fill capacity compared to bladders. This gives them a smaller storage footprint that is often required for storage in urban areas. Click on the link below for more information on the Hydrex range of S / Onion tanks. 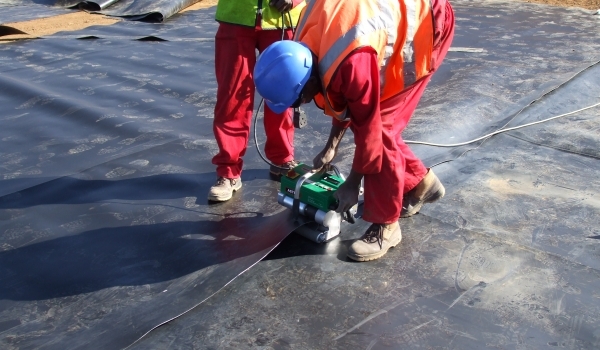 Hydrex® self supporting tanks and quick tanks are made from a high quality food grade PVC coated tarpaulin material. The S-Tanks require no support structures, making them deployable at very short notice. The S tank is available in various sizes ranging from 5000 Litres through to 40 000 Litres, and merely requires a level piece of ground to be used effectively. Used mainly for emergency water storage, the S Tank is used in fire fighting, famine relief and other rapid deployment applications. The quick tank has an inter-locking metal frame. This offers extra rigidity in the tank design. Click on the link below to find out more on the Hydrex range of Fire Water Storage Tanks. 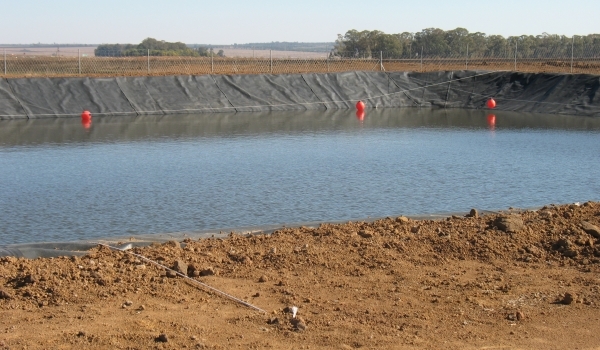 Hydrex® mesh reservoirs offer exceptional value water storage solutions. The mesh reservoir is constructed using a specially designed galvanised mesh. The Hydrex® mesh reservoir comes standard with a high density polyethylene wall protector that gives the liner UV and scuff protection. It further adds to the rigidity of the mesh reservoir range. The mesh reservoir also offers the most affordable water storage solution when compared to any other reservoir type, both in terms of cost, installation and life span. Click on the link below for the full range of Hydrex Mesh reservoirs. The sectional tank comes in water storage capacities of 5, 10 and 15KL. The sectional tank is shipped as a sub assembled product in a crate that is easily transported. The sub assembly makes it ideal for shipment anywhere in Africa compared to the roto moulded product range. Click on the link below to get more information on the Hydrex sectional tank. Hydrex® corrugated reservoirs offer medium to long-term water storage solutions. The corrugated reservoir is constructed using galvanised corrugated sheets. 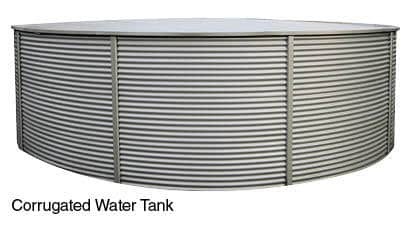 The corrugated reservoir offers a medium weight to structure ratio when compared to other reservoirs. The reservoir can be fitted with grey, black or blue lining. Depending on the application, our PVC liners are available in 600, 750 and 1000 micron. We also stock and can provide chemically resistant speciality liners for the storage of abrasive liquids and certain petro chemicals. These reservoirs are available in various heights and configurations with storage capacities ranging from 5100 litres through to 777 000 litres. Click on the link below for more information on the Hydrex corrugated reservoir range. Click on the link below for more information on the panel reservoir range. Hydrex® pressed steel plate tanks offer heavy duty long term water storage solutions. These tanks can be assembled at ground level or they can be elevated on structural steel towers. Pressed steel tanks that are raised above the ground have the “tank stand” as an integral part of the design. Hence there is no separate platform on which the tank is mounted. 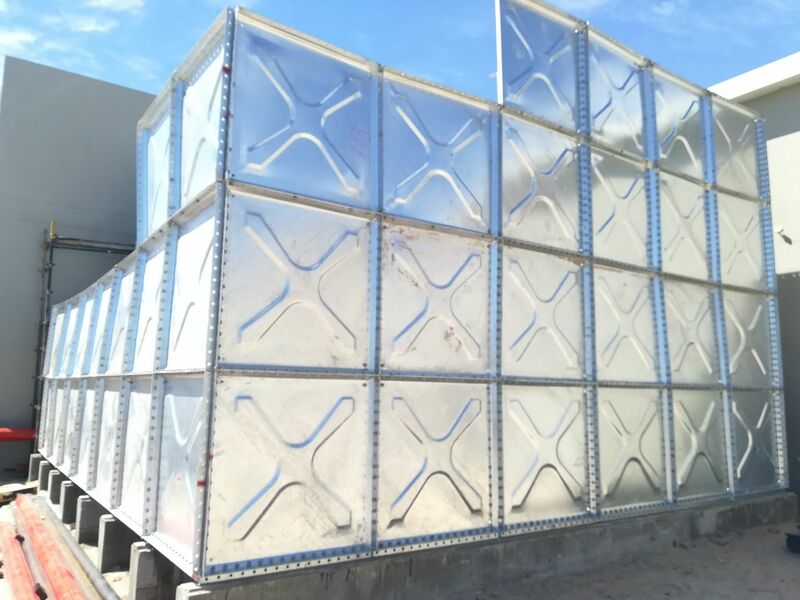 Hydrex® modular pressed steel tanks are suitable for the storage of medium and high water volumes, and can be tailor made to suite various industrial, municipal, fire fighting and other high volume water applications. No inner containment membrane is used in conjunction with the pressed steel panel. The panels are bolted together and are brased from the inside. All pressed steel panels are hot dipped galvanised – hence corrosion resistant, making this product particularly durable and suitable for storage of potable water. 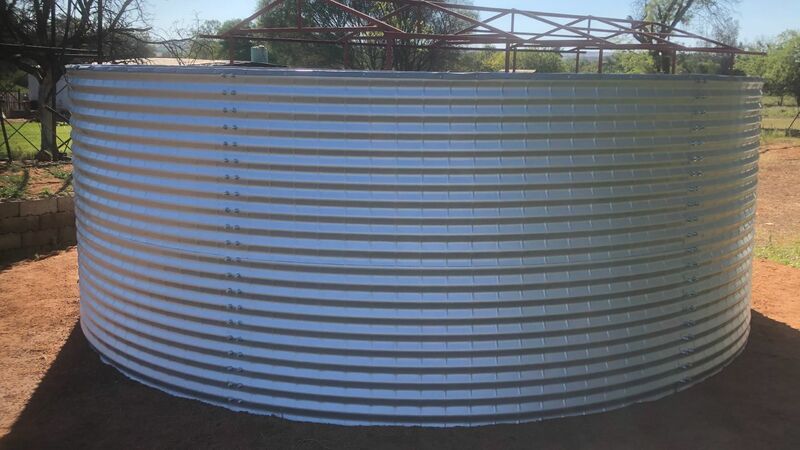 Click on the link below for more information on the Hydrex range of pressed steel tank. 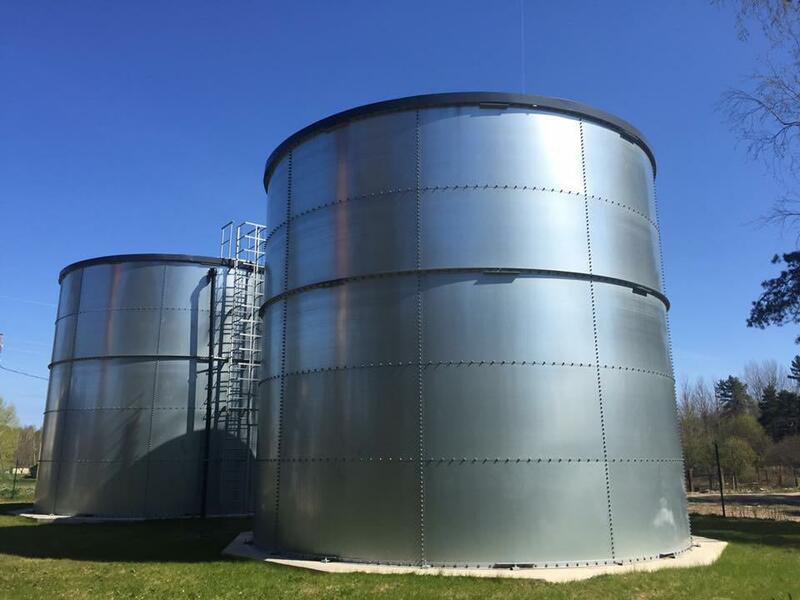 Design of steel plate tanks for different liquid types and applications. Manufacture of tanks and related pipe work. Delivery and logistics management for client. Installation of tanks, pumps, pipe work and related products. 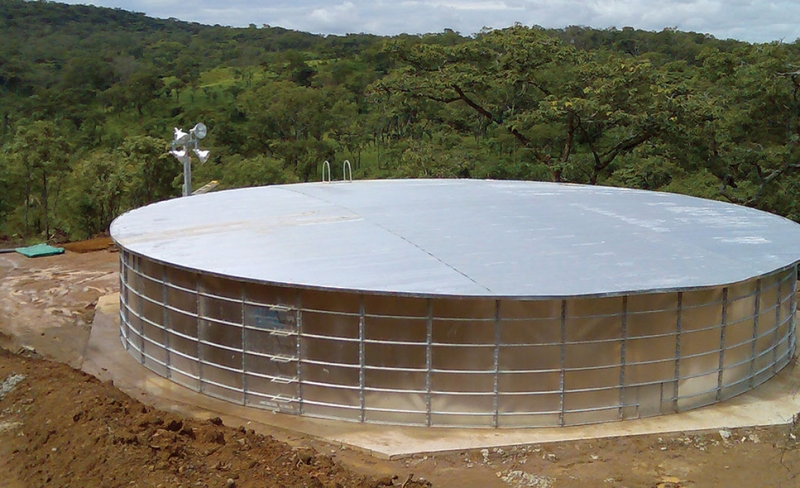 At Hydrex® we are able to design a steel tank / reservoir to meet your exact processing needs. Our standard design caters for water storage and is commonly used to meet ASIB fire water storage regulations. Process water, thickener plants for mines, sewage treatment and bio gas applications have different requirements from a structural and steel coating aspect. Click on the link below for more information on the Hydrex Pressed steel plate tank range of water storage products. Geomembrane Solutions including : Pollution Control Dams / Sewage Ponds / Agricultural Water Storage Dams / Land Fill Linings / Customised Applications. Civil works, including canals and silt traps. We offer various liner types and thicknesses based on clients requirements. These include both HDPE, LDPE, Supported & Unsupported PVC membranes ranging in thickness from 600 Microns through to 2 mm. Pumps, filtration & pipe work requirements. Turnkey dam design and implementation solutions. Earth dam design and excavation, suitable for pollution control, landfills, wetlands and water storage. Storage of larger volumes contaminated water that needs to be processed. Industry segments include mining, industrial waste, waste water management and treatment. Click on the link below for more information on Hydrex earth dams and HDPE lined dames. Please contact our sales support team for additional information and pricing regarding these and other products.